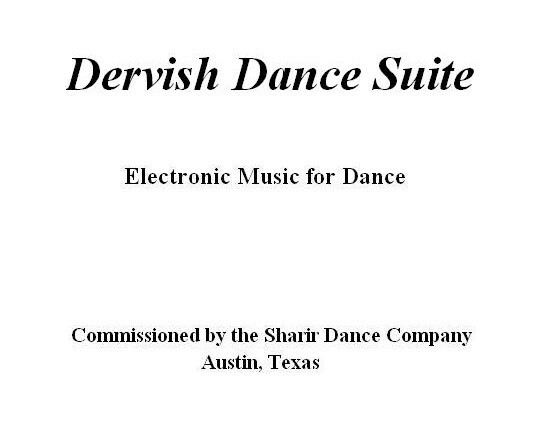 The Dervish Dance Suite (2001) is derived from a 45-minute multimedia work entitled “Dancing with the Virtual Dervish,” that I composed for the Sharir Dance Company in 1993. The original piece contained nine sections, five of which were abstract music videos. The videos were created from a series of navigations made by Yacov Sharir of a virtual world he co-created at the Banff Centre for the Arts with architect Marcos Novak and artist Diane Gromala. Austin videographer Jay Ashcraft subsequently edited the navigations into a series of short videos, for which I then created an electroacoustic sound track. The other four sections, alternating with the videos, were traditional dance numbers, and they form the basis of the Dervish Dance Suite, along with the music from the fifth and final video, which in performance was projected on a solo dancer at the conclusion of the piece. Most of the sounds used in this composition were derived from Ellen Fullman’s Long Stringed Instrument, which was originally housed in an old candy factory in Austin, Texas. This remarkable instrument consists of dozens of extremely long strings (some over 50 feet) that are attached at one end to wooden resonators. The strings are tuned using a system of pure ratios designed by the composer/engineer James McCartney, so the instrument produces an extremely unusual and beautiful resonant sound. In addition to recording Ellen, herself, playing her instrument in the conventional manner, I also generated a variety of other sounds by scraping and striking groups of strings with a metal ruler.